Description: A plain cross with rounded ends. (Obverse) crowned royal cypher with the letters GRI in the centre of George VI, suspended by a ring; (Reverse) plain. Ribbon: Three equal parts of dark blue, white, dark blue. 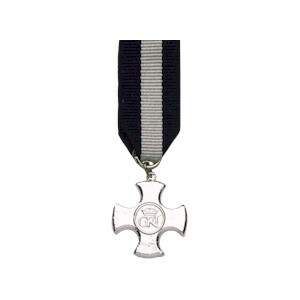 Comments: Known as the Conspicuous Service Cross when instituted, it was awarded to warrant and subordinated officers of the Royal Navy who were ineligible for the DSO. In October 1914 it was renamed the Distinguished Service Cross and thrown open to all naval officers below the rank of Lieutenant Commander. Bars for second awards were authorised in 1916 and in 1931 eligibility for the award was enlarged to include officers of the Merchant Navy. In 1940 Army and RAF officers serving aboard naval vessels also became eligible for the award. Since 1945 fewer than 100 DSC's have been awarded.